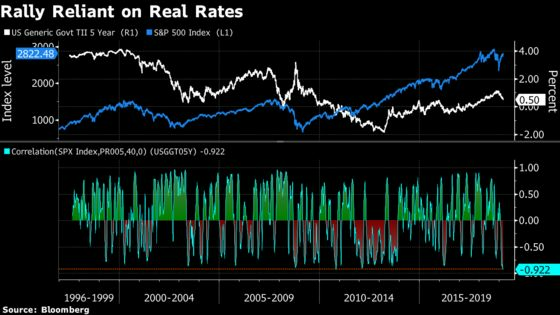 (Bloomberg) -- U.S. markets are dancing to the beat of a rap song that topped the charts more than a decade ago. It’s a “Flo Rida market structure’’ in the eyes of Jefferies Chief Market Strategist David Zervos, who channels the hit to describe the primary features of the current financial and macroeconomic backdrop. He said the eight lows investors should pay attention to right now are: inflation, unemployment, rates, curve, volatility, issuance, spreads and volumes. That’s an homage to the track’s chorus, which is punctuated by accompanying artist T-Pain saying "low" eight consecutive times. “Grinding all these lows even lower over the next few months seems like the most probable path,’’ Zervos wrote. The labor market has been getting ever tighter, wage growth is picking up, and a sustained, broad acceleration in general price pressures has not yet manifested. Options trading shows that the cost of protecting against inflation averaging above 2 percent over the next two or five years remains relatively low by historical standards. The knock-on effects of a perceived low inflation environment are positive for financial asset valuations. One potential danger for markets is if this particular brand of low inflation also leads to downward pressure on margins should companies not pass on rising labor costs to end-buyers. The unemployment rate -- which currently sits at 3.8 percent -- has been below levels the Federal Reserve presently thinks is sustainable over the long term for the past 18 months. 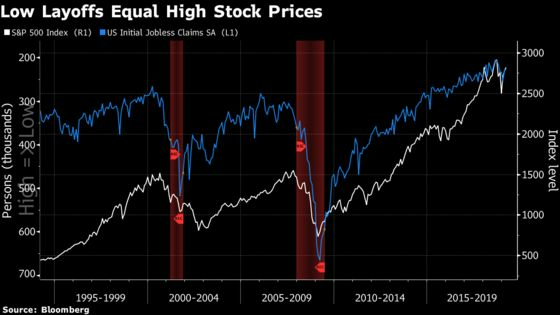 The main upshot for investors: over the past quarter-century, it’s rare to see big stock retreats without a corresponding increase in initial jobless claims -- the highest-frequency read on the U.S. labor market. “Material changes to our low-inflation/low-unemployment economic landscape look highly unlikely,’’ Zervos wrote. 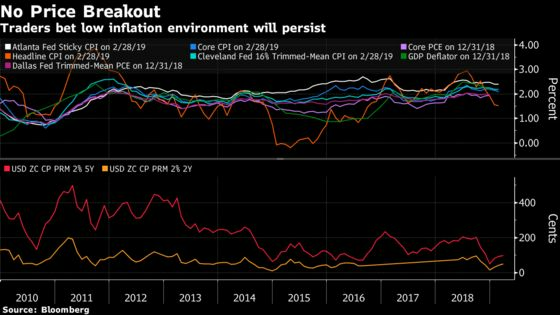 Expectations that inflation will stay low and the Fed will hold off from further tightening have sent U.S. government borrowing costs sinking. 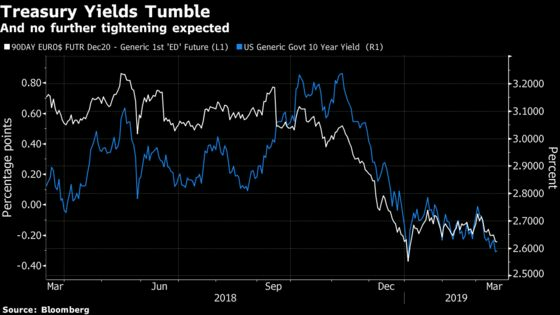 The 10-year Treasury yield has tumbled more than 60 basis points since early November, and the Eurodollar futures curve implies nearly one full cut from the U.S. central bank between now and the end of 2020. The gap between short and longer-term Treasury yields continues to winnow –- a sign of perceived economic fragility over the medium term, even amid little conviction that a recession is imminent. At less than 15 basis points, the difference between 10-year Treasury yields and three-month bills closed at its smallest levels of this cycle on Friday. Some lesser-tracked portions of the Treasury curve, such as 2s5s, are already in negative territory. Corporates, particularly those clinging to an investment-grade rating, may be incented to go on a “debt diet” to bolster their creditworthiness, according to Peter Tchir, head of macro strategy at Academy Securities. New supply in investment grade is down modestly so far in 2019. Issuance of high-yield debt last year was the lowest since 2009 amid tax changes to interest deductibility and demand for leveraged loans. Even as junk bond sales have picked up in January, the market remains firm thanks to strong appetite from retail flows. The nightmare of December has been quickly forgotten, with cross-asset volatility disappearing. 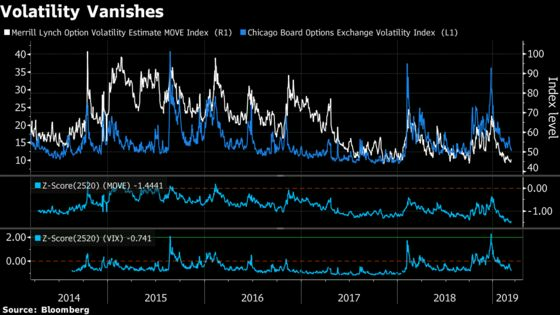 Measures of one-month implied volatility in U.S. stocks plummeting to levels not seen since September’s record highs for the S&P 500 and hovering near an all-time low in the Treasury market. The sum of all fears pertaining to the U.S. credit market is approaching a five-year low, according to a recent Bank of America survey. “U.S. 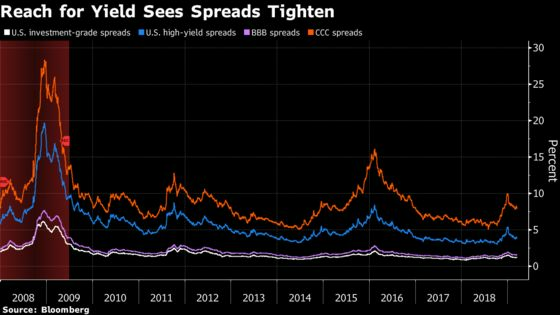 credit investors never bought into market concerns about elevated recession risks priced into financial markets at the turn of the year,’’ wrote Hans Mikkelsen, the head of high-grade credit strategy at the firm. 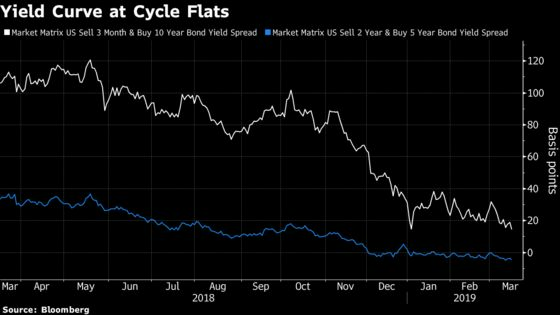 He recently upgraded his year-end forecast to indicate that investment-grade spreads could tighten even more from current levels thanks to the “relatively benign environment’’ ushered in by the Fed. Relatively moribund activity –- especially in U.S. equity index futures –- is partly a function of the above factors: a symptom of those causes. Volumes tend to be lighter in tranquil times, and pick up dramatically in stressed conditions. However, the dearth of trading activity also hints at the potential fragility in market structure, as 2018’s two tumultuous drawdowns were exacerbated by poor liquidity.